When the Soviet Union was dissolved in the fall of 1991 most observers believed that the days of central planning were counted all over the world. Most of them would have been extremely surprised to hear that more than seven years later a nation organized according to Marxist economic principles and Leninist political methods would survive in the middle of the Caribbean. And yet the Cuban Government continues to adhere to those principles — abandoned in practice everywhere else except in North Korea — and it continues to reaffirm them as the fundamental basis of social organization and even of life itself, as in the slogan “socialismo o muerte.” To be sure, the Cuban government has been compelled to make concessions to market capitalism. But these concessions have been essentially tactical, limited in scope and subject to quick reversal when their political implications became problematic. One of the reasons for the remarkable survival capacity of communism in Cuba has been the conviction on the part of the leadership that, while they were likely to face a difficult situation for several years, ultimately time was on their side. Time was on their side because at some point, something would happen to resurrect authoritarian socialism and bring about the inevitable downfall of capitalism. Two important developments played a decisive role in fueling these hopes: the serious problems encountered by some former communist countries in the transition from plan to market; and the crisis in East Asia which, through contagion, quickly became a crisis of emerging markets and, allegedly, a crisis of globalization. In the words of Fidel Castro, financial speculators have turned the world into a “casino,” and the tyranny of the prevailing world order of “neo-liberal globalization” is doomed to disappear after passing through “deep and catastrophic crises.”2 So, after a brief period of triumphalism, market capitalism has failed miserably, at least in the developing world, and the instrument of that failure has been globalization. Marx might have been wrong about the place, the time, and the specific process, but he was right about the eventual result. A new world based on “solidarity, socialism and communism” will emerge, predicted Fidel Castro at the meeting on Globalization and Development held in Havana in January, 1999, from the “profound and catastrophic crisis” of world capitalism. What should we make of all this? Is there any doubt that the East Asian crisis and its aftermath signal the failure of market capitalism? The countries of East Asia, we are told, were the models, the pride and joy of those who advocated market capitalism as a blueprint for development, including the Washington based international financial institutions. And now we are told that these countries are plunged into a terrible economic crisis, and it is clear that the model has failed. Two observations are in order. First, countries like Korea, Thailand, Malaysia, and Indonesia were not exactly wedded to the economic policies recommended by the IMF and the World Bank. Their banking systems were poorly supervised; government interference in their economies was far-reaching; and their trade systems often were complex and restrictive. Other economies in the region that followed more disciplined and market-oriented policies — like Hong Kong and Singapore — fared significantly better. Second, for a long time the East Asian countries did follow some very good policies in certain areas. Their very high rates of domestic saving and investment and their very strong emphasis on human capital formation contributed to an unprecedented increase in incomes and to an impressive reduction in poverty. These achievements have not been erased by the recent crisis, and they will provide a basis for future growth. 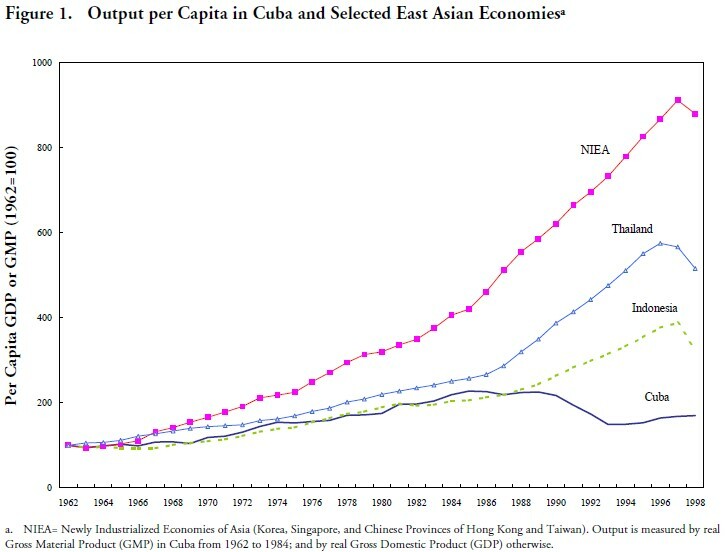 Indeed, even if we take into account the recent downturn, the performance of the East Asian economies over the past four decades has been impressive, and it has been far superior to that of “revolutionary” Cuba. This is clear from Figure 1.3 But surely, socialist Cuba must have performed better than the market-oriented economies of Latin America? Not really. As can be seen in Figure 2, cumulative growth has been stronger in Mexico and Chile than in Cuba since the beginning of the Castro era. This is remarkable given that, during the period covered by the figure, growth in Chile and Mexico was affected by the debt crisis while Cuba received massive financial support and trade subsidies from the Soviet Union for three decades. Let me conclude on this point with a comment on globalization. To the Cuban leaders, “neo-liberal globalization” appears almost like a killer on the loose, a rampaging monster destroying whole economies and nations, and seemingly engineered by some sinister conspiracy. This is not a very useful way to look at it. Globalization is largely the result of historical forces outside the immediate control of policy makers: farreaching technological changes in communications and information processing coupled with the advent of huge institutional investors, like pension funds. Technological and institutional innovations cannot be unlearned. Therefore, the rational approach to globalization is not to fight it, but rather to learn to live with it as well as possible – taking advantage of the substantial benefits it affords while guarding against the danger of instability that it raises. TRANSITION FROM PLAN TO MARKET: HAS IT FAILED? The other argument made by Cuban officials in supporting their continued emphasis on centralized control is based on the claim that former communist countries have failed in their transition to market economies. And the faster these countries have tried to transform themselves into market economies, the more disastrous has the result been. This is a point that was made repeatedly at the conference on Globalization and Development held in Havana in January, 1999. 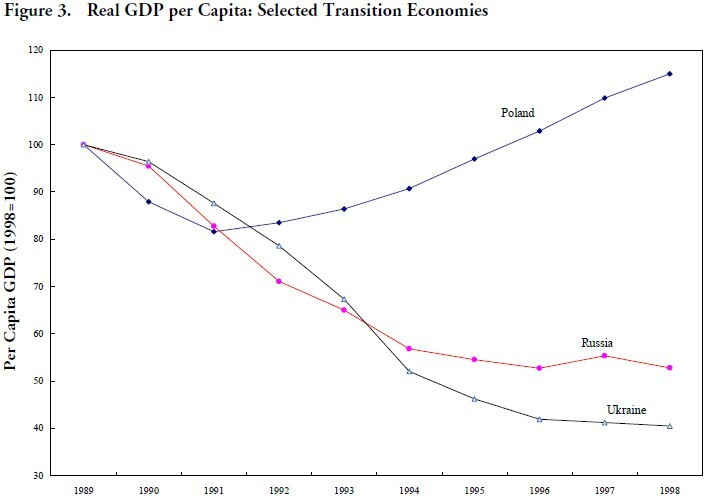 Figure 3 shows the behavior of output in three transition economies:5 Poland, a country that took an early and ambitious start in the process of liberalization; Russia, which could be called an intermediate reformer; and Ukraine, a slow reformer. In the countries that moved rapidly, like Poland, the contraction of output in the early stages of reform is relatively steep. This is because price decontrol and the elimination of state orders speed up the inevitable collapse of the inefficient capital stock inherited from the old regime. At the same time, the growth of output from the new enterprises that are willing and able to operate in a free market without subsidies is relatively slow. It is slow because there is learning-by-doing, and because it takes time to restructure the capital released by the old enterprises and adapt it to new forms of production and marketing. Yet, after a while, output in the country where liberalization has been rapid and strong turns around and begins to grow rapidly, while among the slow reformers output continues to fall and eventually bottoms out much later and at a much lower level. Of course there are other factors behind the differences in economic performance among transition countries. They include: armed conflicts (which have complicated reform efforts in countries like Croatia, Armenia, and Azerbaijan); the size of the industrial sector that must be restructured (a particularly heavy burden in the case of Russia but a relatively small one in the primarily agrarian economies of China and Vietnam); and the location of the country relative to advanced market economies. They also include the length of the period of communist rule (because the longer this period, the more ingrained the central planning mechanisms, the more intricate the relations with the USSR and other planned economies, and the dimmer the memory of markets). Both location and history went against Russia and Ukraine, while Poland fared much better on both counts. One important question remains. Why has Russia, which was not a particularly weak or slow reformer, done so poorly in terms of output? This is a vast topic, but some important reasons should be mentioned. First, Russia inherited a heavy debt burden on behalf of the entire Soviet Union,6 and then added to it excessively. Second, Russia’s attempt to stop inflation by fixing the exchange rate and replacing monetary financing by debt financing appeared to succeed at first, but predictably ended up in a major financial crisis in August, 1998. Third, as mentioned before, Russia was far—in distance and in time—from the experience of free markets and democracy. This contributed to institutional and psychological inertia, including foot-dragging and even sabotage by those who opposed reforms. Fourth, official output statistics probably underestimate true output in Russia to a much greater extent than in other former communist countries—those of Central Europe, for example—because of a particularly large underground economy. As difficult as Russia’s problems are, however, they will probably not lead to social and political collapse. Democracy is now well entrenched, and the freedoms associated with it are valued by the Russian people—including the right to say and to print what they want. Although it will continue to complicate the government’s task, the Communists Party is unlikely to return to power through the next presidential elections. As usual, the Party’s candidate will probably win a plurality of the vote in the first round and then lose in the second round. But whoever wins, one thing is clear: there is no taste anywhere in the Russian political spectrum for large scale subsidization of a foreign state, particularly of one like Cuba that owes the Russian Federation billions of dollars and refuses to pay. So much for that dream. ARE THERE ANY LESSONS FOR CUBA? Two basic conclusions should be drawn from this analysis. First, liberalization and reform have not failed in the transition countries. They are working, in spite of the massive problems inherited from the old regime. Many of these countries are now experiencing positive growth, and some of them, like Poland, Slovakia, the Baltic countries and the Transcaucasian republics have expanded by an average of more than 4 percent per annum over the past three years.7 Second, gradualism does not pay. In general the countries like Poland and Estonia that liberalized aggressively and at an early stage, after a difficult beginning have fared much better than the slow reformers like Ukraine and Turkmenistan. This analysis of the problems of transition can also help to clarify a recent debate between Carmelo Mesa-Lago and Carlos Solchaga, among others, on whether the transition in Cuba is likely to be more or less painful and lengthy than elsewhere.8 I believe that with good policies and with political tranquility and social peace, the transition can be relatively short. First, because Cuba’s industrial sector is comparatively small so that the cost of restructuring will be correspondingly low. Second because the supply response of the relatively large agricultural sector to price liberalization is high, as has been demonstrated not only in countries like China, but also in past (and current) episodes of liberalization in Cuba itself. Third because Cuba’s location, close to the largest and fastest growing advanced market economy, will help the development of the export sector, particularly the tourist sector. And fourth, because much of the old, subsidized and inefficient production has already collapsed, and much of the output decline that affected the initial phase of reform in other transition countries is already behind us in the case of Cuba. This is also true of many of the much-vaunted social services offered by the state, including health and education services and pensions. They have now dropped to such low levels in real terms that it should be possible to replace them by more rational and better- targeted, yet sufficiently generous alternatives in the not too distant future. A similar point can be made regarding infrastructure. But there are two big ifs. First and foremost there must be peace, without which the all-important tourist sector will collapse. This will require political reconciliation and an implacable resolve to avoid an explosion of organized crime. Second, policy makers must learn from the achievements and the mistakes of both the countries in transition and the emerging market economies. I will conclude by mentioning just a few key lessons, mostly in the macroeconomic area. • Prices must be liberalized without delay. Historical and econometric evidence show that there is nothing to be gained by waiting and much to be lost. In particular, full liberalization of agricultural prices and complete elimination of the quotas currently assigned by the Ministry of Agriculture should be immediate. • At the same time, the exchange system should be liberalized. Together, price, and exchange system liberalization will resolve the problem of rationing, remove some of the most serious distortions that currently hinder resource allocation, and put an end to the existing dual economy and to the unjust privileges it confers on those that have access to dollars. Of course, the exchange rate will have to be unified—there is no sense in replacing a distorted system by another distorted system— and the adverse income effect of price liberalization on those citizens earning peso wages will have to be cushioned by a general salary increase. Needless to say that, given the absence of foreign exchange reserves, the exchange rate initially will have to float so as to equilibrate demand and supply of pesos at a level that cannot possibly be determined ex ante. • Even in the medium-term, the unpredictable, but probably substantial, changes in economic structure that are likely to occur during the transition will require a flexible and competitive exchange rate. In the very long run, the recent experience of too many emerging market countries suggests that the serious risks of a fixed exchange rate system in terms of financial vulnerability will have to be carefully balanced against the possible advantages of that system for a small and hopefully open economy. But there is time for that. Currency boards and dollarization could be considered but these are politically far-reaching ideas that cannot simply be adopted by technocrats behind closed doors; in due time, they should be submitted to the Cuban people by referendum. • Inflation will have to be kept under strict control from the outset, but this does not necessarily mean a nominal exchange rate anchor. A target for base money coupled with a substantial degree of central bank independence will do just fine provided it is well understood that there is no high-powered money for the government. Any fiscal deficit would have to be covered by concessional development assistance, some long-term external borrowing on market terms and, once a Treasury bill market has been organized, by domestic borrowing. However, one of the clear lessons of the recent emerging market crisis is that both domestic and foreign public debt will have to be strictly limited, if possible by law, and short-term debt denominated in foreign currency will simply have to be prohibited. • Except for the central bank, existing banking institutions will have to be broken down, privatized, and subject to positively ferocious bank supervision by a strictly independent regulator. • In order to encourage investment and reward work effort, marginal tax rates should be as low as permitted by the state’s expenditure priorities, but tax exemptions should be rigorously avoided and there should be no tolerance for tax arrears by enterprises, large or small. • Restrictions on self-employment should be immediately eliminated, and the taxes and fees imposed on this sector substantially reduced. Small and medium enterprises should be privatized as soon as possible. As for large-scale enterprises, decisions on whether they should be sold outright, restructured and then privatized, or liquidated will benefit from the vast experience of many other countries, and particularly of the transition countries. These decisions could take more time. However, it is clear form experience that large enterprises will have to be subject to strict laws to enforce competition and to tight limits on their external indebtedness. None of this will work, of course, if the country’s leadership is not able and willing to enforce honesty in government, to resist pressures from concentrated groups for subsidies, exemptions and other privileges, and to adopt an uncompromising attitude with respect to organized crime. These are very hard things to do given the ethical void left by a regime that did its best to destroy old values while creating new myths that, by now, have evaporated into disappointment and skepticism. They will be particularly difficult to do at a time when the liberalization of the economy and of society in general creates opportunities for fast enrichment. Why then should the government move to full liberalization? Because it is the only way to create wealth on a durable basis. And the only way to ensure that the country is not only for the foreign investors, not only for those who benefit from privileges because of political affiliation or family connections; but that the nation is really for all Cubans. This is the way to go. Death is not really the only or the best alternative to socialism. 1. The views expressed in this paper are the author’s and not necessarily those of the International Monetary Fund. A previous version of this paper was presented at the Cuba Transition Workshop, co-organized by Shaw, Pittman, Potts and Trowbridge and the Association for the Study of the Cuban Economy in Washington, D.C., on March 25, 1999. The author would like to thank Jorge Pérez-López for useful comments. 2. P. Fletcher, “Castro says global capitalism doomed.” Reuters, Havana (January 23, 1999). 3. The output per capita indexes used in Figures 1 and 2 were obtained by accumulating (from a base of 100 in 1962) percentage changes in the ratio of gross domestic product (GDP) or gross material product (GMP) to population. 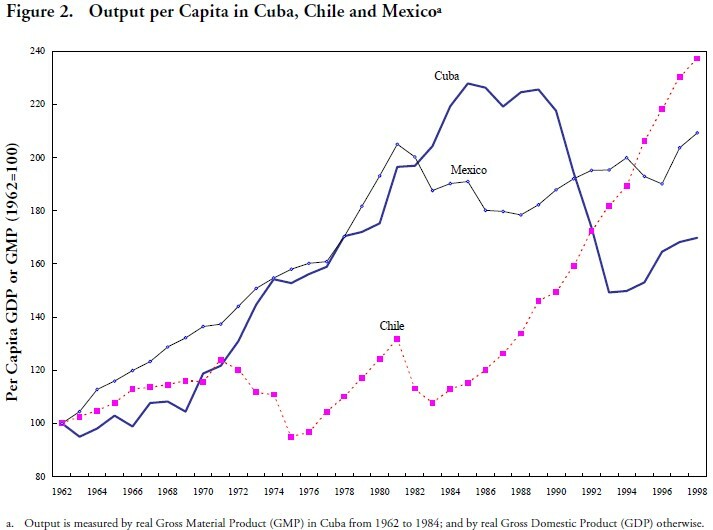 The index for Cuba is based on GMP through 1984, and on gross domestic product (GDP) from 1985 to 1988. The underlying GMP data are from Manuel E. Madrid-Aris, Growth, Human Capital and Technological Change in a Centrally Planned Economy: Evidence from Cuba (Unpublished: 1998.) Data for GDP in Cuba are from Comisión Económica para América Latina y el Caribe, La Economía Cubana: Reformas estructurales y desepeño en los noventa. Fondo de Cultura Económica. (Mexico: 1997) for the period 1985-1995, and from statements by Cuban officials from 1996 to 1998. The output per capita indexes for all other countries are based on GDP and derived from the IMF’s World Economic Outlook database. 4. See, among others, Ernesto Hernández-Catá, “Liberalization and the Behavior of Output during the Transition from Plan to Market,” IMF Staff Papers (December 1997); and Martha de Melo, Cevdet Denizer, Allan Gelb, and Stoyan Tenev, “Circumstance and Choice. The Role of Initial Conditions in Transition Economies,” Policy Research Working Paper 1866, The World Bank (December 1997). 6. Russia also inherited Soviet claims on many developing countries, but these have been re-negotiated with deep discounts (e.g., Nicaragua and Peru), are being re-negotiated (as in the case of many African countries), or remain in arrears (e.g., Cuba). 7. In 1998 the list of countries that had experienced positive growth for at least 3 consecutive years included Croatia, Slovenia, the Slovak Republic, Hungary, Poland, the three Baltic countries (Estonia, Latvia and Lithuania), the three Transcaucasian republics (Armenia, Georgia and Azerbaijan), the Kyrgyz Republic, Uzbekistan and Mongolia. China of course has had a much longer period of high growth. 8. See Carmelo Mesa-Lago, Carlos Quijano, Alberto Recarte, José Juan Ruiz, and Carlos Solchaga, “La economía cubana: hipótesis de futuro.” Encuentro de la Cultura Cubana, invierno de 1998/1999.